Quiet times look different for everyone. 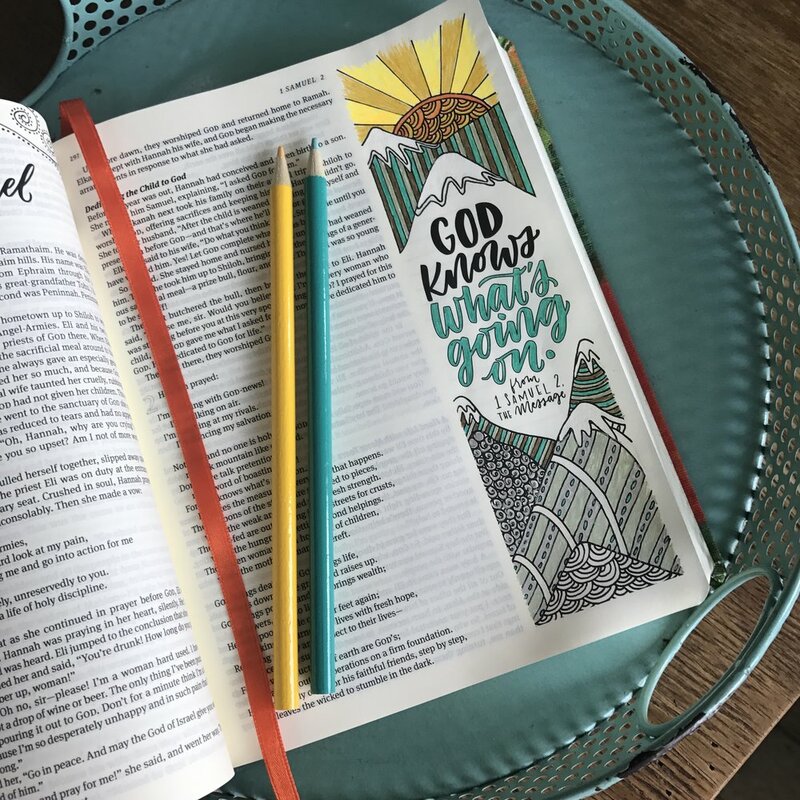 Some of my favorite quiet times have been when I’ve got my Bible, journal (and 2-3 other books scattered around), colored pencils, and my fav worship playlist going. And coffee. There must be coffee. That’s my ideal quiet time. My husband- he prefers a Bible app and headphones. Wherever you are on the spectrum, God gave you a creative mind, and the one thing He gave us that is limitless is our imagination! But I've found that for many, when we're in a season of waiting, our quiet times can feel stale, underwhelming, or simply emotional. God desires us to draw near to Him, and He promises that when we do, He will draw near to US! Just because you're waiting on Him, doesn't mean your quiet times have to feel like elevator music. We've created this devotional of sorts to jump start your creativity as well as your relationship with the Lord where it may have begun to feel dry. We challenge you to use your creativity to draw closer to Him, to worship Him, and to give Him glory. Details: We’ve provided 2-3 scriptures per week so that you can really take time and meditate on them. But feel free to add your own or change the timeline! We offer a scripture, an image for inspiration, as well as a DIG DEEPER section! Do WHATEVER idea the Lord puts on your mind for each verse! That might be simply writing the verse in your journal 5 times in a row, maybe it’s using chalk on a decorative chalkboard or drawing in your journaling Bible. You can do the same thing each day or something completely different. When you finish one of the scriptures (even if it’s simply writing it out) post a photo to Instagram with the hashtag #fruitfulchallenge. Most importantly… Ask God what He wants to say to you about each verse!! DIG DEEPER this week by studying and meditating on Proverbs 3. Eccl 6:7 "We work to feed our appetites; Meanwhile our souls go hungry." 1 Sam 2:3 "God knows what’s going on." DIG DEEPER by learning Hannahs' story of (in)fertility HERE! Job 41:11 "I’m in charge of all this—I run this universe!" DIG DEEPER by soaking in the amazing plans He has for you in Jeremiah! I love this part: "I know what I'm doing, I have it all planned out..."
Heb 4:16 "Take the mercy, accept the help." DIG DEEPER by receiving help this week!!! Ex 14:14 "God will fight the battle for you." DIG DEEPER in Isaiah! Here are a few references (click for links) about God fighting our battles for us! He's on YOUR side and He LOVES you! Isaiah 55:8 "The way you work isn’t the way I work. God’s Decree." Isaiah 9:2 "For those who lived in a land of deep shadows— light! sunbursts of light!" DIG DEEPER by asking God to bring wholeness and light into your dark places. Isaiah 9 goes on to share what the coming King (Jesus) would be for us: "His names will be: Amazing Counselor, Strong God, Eternal Father, Prince of Wholeness. His ruling authority will grow, and there’ll be no limits to the wholeness he brings." Meditate on that! DIG DEEPER by writing some of the things God has done for you EVEN in this difficult season. Gal 6:9 "Let’s not allow ourselves to get fatigued doing good." DIG DEEPER by reading and journaling James 1! Eph 6:10 "God is strong, and he wants you strong." DIG DEEPER by finishing Ephesians 6 in the Message Version. Here's a taste: "Be prepared. You’re up against far more than you can handle on your own. Take all the help you can get, every weapon God has issued, so that when it’s all over but the shouting you’ll still be on your feet." If you have been blessed by our programs and resources, will you partner with us financially? I Am Fruitful is a non-profit 501(c)3, and your donation is tax-deductible!